What is the Leftovers Club? 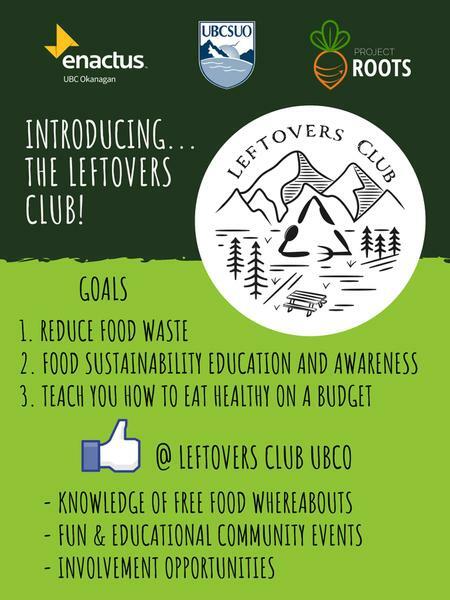 By Wey Lynn Liong - Events Editor · April 1st, 2019 at 12:19 p.m.
UBCO Leftovers Club aims to reduce food waste on campus. Poster from the Leftover Club's Facebook page. Ever wondered where all the leftover food goes after events? Normally, it all goes into the trash, which contributes to food waste around the world. To tackle that problem, UBCO students, Benjamin Dunn and Samantha Singer, took the initiative in starting the Leftovers Club. The founders of the Leftovers Club stated that the club runs with these main pillars in mind: reducing food waste on campus, educating students about food sustainability, and teaching students how to eat healthy on a budget. In terms of reducing food waste, the club hopes to reduce up to 1000 pounds of food from being thrown away by the end of the year. As of now, the club has saved approximately 100 pounds of food and are optimistic about reaching their goal. “We're very confident in our ability to [reach our goal] because we have met with the head of Food Services on this campus, and Food Services are going to be switching from Aramark to a UBC in-house service. So, they're going to be very willing to work with students who meet their ideas, and we pitched the Leftovers Club,” Dunn said, adding that Food Services were keen on working with them to improve sustainability and reduce waste. Singer also teased a possible Kombucha tutorial event that will take place in April. Keep an eye out for an update regarding their upcoming events on their Facebook page. As the club is relatively new, Dunn encourages students to get involved, make a difference and volunteer in the coming school year. If students are interested, they can email the club through leftoversubco@gmail.com, or stay updated about weekly meetings and other events through their page.